For other uses, see Darfur (disambiguation). Darfur (Arabic: دار فور‎‎ Dār Fūr, English: Realm of the Fur) is a region in western Sudan. It was firstly named Dardaju (Arabic: دار داجو‎‎) when the Daju, who migrated from Meroe c.350 AD, were ruling. Then renamed Dartunjur (Arabic: دار تنجر‎‎) when the Tunjur were ruling the country and who had been replaced by the recent Fur immigrants from Dar Fartit in the Central Africa. Darfur (Dar is an Arabic word that means 'place of or land of' the Fur people) was an independent sultanate for several hundred years, incorporated into Sudan by Anglo-Egyptian forces in 1916. The region is divided into five federal states: Central Darfur, East Darfur, North Darfur, South Darfur and West Darfur. Because of the war in Darfur between Sudanese government forces and the indigenous population, the region has been in a state of humanitarian emergency since 2003. Darfur covers an area of 493,180 square kilometers (190,420 sq mi), approximately the size of Spain. It is largely an arid plateau with the Marrah Mountains (Jebel Marra), a range of volcanic peaks rising up to 3,042 meters (9,980 ft) of topographic prominence, in the center of the region. The region's main towns are Al Fashir and Nyala. There are four main features of its physical geography. The whole eastern half of Darfur is covered with plains and low hills of sandy soils, known as goz, and sandstone hills. In many places the goz is waterless and can only be inhabited where there are water reservoirs or deep boreholes. While dry, goz may also support rich pasture and arable land. To the north the goz is overtaken by the desert sands of the Sahara. A second feature are the wadis, which range from seasonal watercourses that flood only occasionally during the wet season to large wadis that flood for most of the rains and flow from western Darfur hundreds of kilometres west to Lake Chad. Many wadis have pans of alluvium with rich heavy soil that are also difficult to cultivate. Western Darfur is dominated by the third feature, basement rock, sometimes covered with a thin layer of sandy soil. Basement rock is too infertile to be farmed, but provides sporadic forest cover that can be grazed by animals. The fourth and final feature are the Marrah Mountains and Daju Hills, volcanic plugs created by a massif, that rise up to a peak at Deriba crater where there is a small area of temperate climate, high rainfall and permanent springs of water. Remote sensing has detected the imprint of a vast underground lake under Darfur. The potential water deposits are estimated at 49,500 km2 (19,110 sq mi). The lake, during epochs when the region was more humid, would have contained about 2500 km3 (607 cubic miles) of water. It may have dried up thousands of years ago. Some conjectures include the area of Darfur as part of the Proto-Afro-Asiatic Urheimat in distant prehistoric times (c. 10,000 BC), though numerous other theories exclude Darfur. Most of the region consists of a semi-arid plain and thus appears unsuitable for developing a large and complex civilization. But the Marrah Mountains offer plentiful water, and the Daju people created the first known Western Nile Valley civilization known as Empire in between the Rivers-based first at Gadir Mountain in Kordofan then relocated to the Marrah Mountains in c. 1100 AD in the Marrah Mountains, and they left records of valuable rock engravings, circular stone huts at Marrah Mountains, greater human excavation at Um Kardous Mountain as a result of Kasifrogei's tragic tale and they have a list of kings from Gadir in Kordofan to Ahmad Al-Daj in Darfur. The Tunjur replaced the Daju in the fourteenth century and the Daju established new headquarters in Abyei, Denga, Darsila and Mongo in the current Chad. The Tunjur sultans intermarried with the Fur and sultan Musa Sulayman (reigned c.1667 to c.1695) is considered the founder of the Keira dynasty. Darfur became a great power of the Sahel under the Keira dynasty, expanding its borders as far east as the Atbarah River and attracting immigrants from Bornu and Bagirmi. During the mid-18th century conflict between rival factions wracked the country, and external war pitted Darfur against Sennar and Wadai. In 1875, the weakened kingdom was destroyed by the Egyptian ruler set up in Khartoum, largely through the machinations of Sebehr Rahma, a slave-trader, who was competing with the dar over access to ivory in Bahr el Ghazal to the south of Darfur. The Darfuris were restive under Egyptian rule, but were no more predisposed to accept the rule of the self-proclaimed Mahdi, Muhammad Ahmad, when in 1882 his Emir of Darfur, who came from the Southern Darfur Arab Rizeigat tribe led by Sheikh Madibbo, defeated the Ottoman forces led by Slatin Pasha (that had just invaded Egypt earlier that year) in Darfur. When Ahmad's successor, Abdallahi ibn Muhammad, himself an Arab of Southern Darfur from the Ta’isha tribe, demanded that the pastoralist tribes provide soldiers, several tribes rose up in revolt. Following the overthrow of Abdallahi at Omdurman in 1899 by the Anglo-Egyptian forces, the new Anglo-Egyptian government recognized Ali Dinar as the sultan of Darfur and largely left the Dar to its own affairs except for a nominal annual tribute. In 1916 the British, concerned that the sultanate might fall under the influence of the Ottoman Empire, invaded and incorporated Darfur into the Anglo-Egyptian Sudan. Colonial rule directed financial and administrative resources to the tribes of central Sudan near Khartoum - to the detriment of the outlying regions such as Darfur. 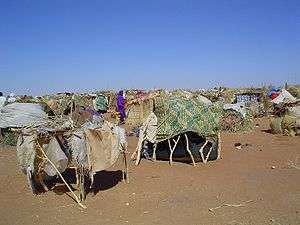 Camp of Darfuris internally displaced by the ongoing War in Darfur. A pattern of skewed economic development continued after Sudan achieved political independence in 1956. The proxy wars between Sudan, Libya and Chad added an element of political instability. Darfurians, including those identified as "Arab" and "African" people, began to respond to the ideology of Arab supremacy propagated by Libyan leader Muammar al-Gaddafi (in power 1969-2011). A famine in the mid-1980s disrupted many societal structures and led to the first significant modern fighting amongst Darfuris. A low-level conflict continued for the next fifteen years, with the government co-opting and arming Arab Janjaweed militias against its enemies. The fighting reached a peak in 2003 with the beginning of the Darfur conflict, in which the resistance coalesced into a roughly cohesive rebel movement. Human-rights groups and the UN, March, 2004, came to regard the conflict as one of the worst humanitarian disasters in the world. The insurgency and counter-insurgency have led to 480,000 deaths (the Khartoum government disputes the numbers). "By 2010 about 300,000 had died, according to the UN best estimate and about 3,000,000 were forced into refugee camps" Over 2.8 million people have become displaced since 2003, many of whom were children (see Lost Boys of Sudan). Many of these refugees have gone into camps where emergency aid has created conditions that, although extremely basic, are better than in the villages, which offer no protection against the various militias that operate in the region. Whilst nearly two-thirds of the population continues to struggle to survive in remote villages, the international community has largely overlooked their needs, and in the face of soaring inflation in Sudan many families face serious difficulties. Virtually no foreigners visit the region because of the fear of kidnapping, and only some non-governmental organizations continue to provide long-term grass-roots assistance. As of 2015 the United Nations is in discussion with the Government of Sudan over the withdrawal of UNAMID, the peacekeeping force, which is the largest in the world. Its prospective withdrawal and that of other UN agencies (such as the WFP) which are already working on their exit strategies from the region is likely to impact on the already beleaguered communities. Darfur is listed as a major source of migrants in the Calais jungle. The Government of Sudan and the Sudan Liberation Movement of Minni Minnawi signed a Darfur Peace Agreement in 2006. Only one rebel group, the Sudan Liberation Movement, subscribed to the agreement; the Justice and Equality Movement rejected it, resulting in a continuation of the conflict. The agreement includes provisions for wealth sharing and power sharing, and established a Transitional Darfur Regional Authority to help administer Darfur until a referendum could take place on the future of the region. The leader of the Sudan Liberation Movement, Minni Minnawi, was appointed Senior Assistant to the President of Sudan and Chairman of the transitional authority in 2007. In December 2010, representatives of the Liberation and Justice Movement, an umbrella organisation of ten rebel groups, formed in February of that year, started a fresh round of talks with the Sudanese Government in Doha, Qatar. A new rebel group, the Sudanese Alliance Resistance Forces in Darfur, was formed and the Justice and Equality Movement planned further talks. The talks ended on December 19 without a new peace agreement, but participants agreed on basic principles, including a regional authority and a referendum on autonomy for Darfur. The possibility of a Darfuri Vice-President was also discussed. In January 2011, the leader of the Liberation and Justice Movement, Dr. Tijani Sese, stated that the movement had accepted the core proposals of the Darfur peace document proposed by the joint-mediators in Doha; the proposals included a $300,000,000 compensation package for victims of atrocities in Darfur and special courts to conduct trials of persons accused of human-rights violations. Proposals for a new Darfur Regional Authority were also included; this authority would have an executive council of 18 ministers and would remain in place for five years. The current three Darfur states and state governments would also continue to exist during this period. In February 2011 the Sudanese Government rejected the idea of a single region headed by a vice-president from the region. On 29 January, the leaders of the Liberation and Justice Movement and the Justice and Equality Movement issued a joint statement affirming their commitment to the Doha negotiations and agreement to attend the Doha forum on 5 February. The Sudanese government had not yet agreed to attend the forum on that date and instead favoured an internal peace process without the involvement of rebel groups. Later in February, the Sudanese Government agreed to return to the Doha peace forum with a view to complete a new peace agreement by the end of that month. On 25 February, both the Liberation and Justice Movement and the Justice and Equality Movement announced that they had rejected the peace document proposed by the mediators in Doha. The main sticking points were the issues of a Darfuri vice-president and compensation for victims. The Sudanese government had not commented on the peace document. At the Doha Peace Forum in June, the Joint Mediators proposed a new Darfur Peace Agreement, which would supersede the Abuja Agreement of 2005 and if signed, would halt preparations for a Darfur status referendum. The proposal included provisions for a Darfuri Vice-President and an administrative structure that includes both the three states and a strategic regional authority, the Darfur Regional Authority, to oversee Darfur as a whole. The new agreement was signed by the Government of Sudan and the Liberation and Justice Movement on 14 July. The Sudan Liberation Movement and the Justice and Equality Movement did not sign the new document at that time but had three months in which to do so if they wished. Languages of Darfur include Arabic, Daju, Erenga, Fongoro, Fulbe, Fur (thus the name of the region), Masalit, Sinyar, Tama, Midob, and Zaghawa. The region is now divided into five federal states: Central Darfur, East Darfur, North Darfur, South Darfur and West Darfur. The Darfur Peace Agreement of 2006 established a Transitional Darfur Regional Authority as an interim authority for the region. The agreement stated that a referendum on the status of Darfur should be held no later than 2011. Minni Minnawi was the first chair of this authority, holding that office from April 2007 until December 2010, when he was succeeded by Shartai Jaafar Abdel Hakam. The peace agreement that was signed in July 2011 saw the Transitional Darfur Regional Authority reconstituted as the Darfur Regional Authority with executive and legislative functions. The chairperson of the Darfur Regional Authority, Tijani Sese, assumed the post on 20 September 2011. 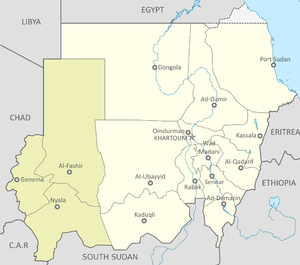 The regional authority was dissolved in July 2016 following a referendum, on the status of the Darfur region within Sudan. In 2008, Darfur's population was 7.5 million. This in an increase by nearly six times from 1973 (1.3 million). 52% are aged 16 years or younger. Darfur's budget was US $286 million in 2008. Arkell, A. J., "A History of Darfur. Part II: The Tunjur etc", Sudan Notes and Records, 32, 2 (1951), 207–238. Daly, M.W., Darfur's Sorrow: A History of Destruction and Genocide, Cambridge 2010. Nachtigal, G. transl. H. Fisher, Sahara and Sudan, vol. IV (vol. III, 1889), London 1971. O'Fahey, R. S., The Darfur Sultanate: A History, London 2008. ↑ "Sudan's Geography". Globaldreamers.org. Retrieved 2010-07-13. ↑ R. S. O'Fahey (2004-05-15). "Darfur: A complex ethnic reality with a long history". The New York Times. Retrieved 2013-01-19. ↑ "Congressional Reps Give Update on Troubled Darfur Region of Sudan". Pbs.org. 2005-02-17. Retrieved 2010-07-13. ↑ "Quick guide: Darfur - BBC News, 2006-09-06". BBC News. 2006-09-06. Retrieved 2010-07-13. ↑ "Africa Ultra-Prominences". Peaklist.org. 2007-05-10. Retrieved 2010-07-13. ↑ "Calais 'Jungle': Migrants hit dead end in journey to UK". .. among those fleeing Darfur, Afghanistan, Syria, Iraq, Eritrea and other zones of conflict or poverty. ↑ "EXCLUSIVE: Darfur new rebel group announces formation of its structure - Sudan Tribune: Plural news and views on Sudan". Sudan Tribune. Retrieved 2011-09-05. ↑ "Sudan Peace Watch-December 21, 2010 | Enough". Enoughproject.org. 2010-12-21. Retrieved 2011-09-05. ↑ "Sudanese government, LJM rebels to sign a peace accord on 19 December - Sudan Tribune: Plural news and views on Sudan". Sudan Tribune. Retrieved 2011-09-05. ↑ "Mediators propose Darfur Authority, announce major diplomatic effort | Radio Dabanga". 195.190.28.213. Retrieved 2011-09-05. ↑ "DOHA: Darfur peace proposals accepted by LJM rebel coalition | Radio Dabanga". 195.190.28.213. 2011-07-09. Retrieved 2011-09-05. ↑ "Alliance of rebel factions agrees to Darfur peace deal". Monsters and Critics. 2011-01-03. Retrieved 2011-09-05. ↑ "Sudan Human Rights Information Gateway (SHRIG) - Office of VP must meet National standards, says El Haj Adam". SHRIG. 2011-02-07. Retrieved 2011-09-05. ↑ Stephen Kinzer (2010-01-24). "End human rights imperialism now". Sudanjem.com. Retrieved 2011-09-05. ↑ "Sudan government to return chief negotiator to Doha | Radio Dabanga". 195.190.28.213. Retrieved 2011-09-05. ↑ "Darfur movements reject Doha peace proposal | Radio dabanga". 195.190.28.213. Retrieved 2011-09-05. ↑ "Under peace deal, Sudan would halt prep for Darfur Referendum". Radio Dabanga. Retrieved 2011-09-05. ↑ "Darfur peace agreement to be signed on 14 July - Sudan Tribune: Plural news and views on Sudan". Sudan Tribune. Retrieved 2011-09-05. 1 2 "Sudan Tribune". Sudan Tribune. Retrieved 2010-07-13. 1 2 3 4 "Beyond Emergency Relief: Longer-term trends and priorities for UN agencies in Darfur" (PDF). United Nations Environment Programme. 30 September 2010. Retrieved 11 January 2014. Wikimedia Commons has media related to Darfur. Photographer's Account - "The Cost of Silence: A Traveling Exhibition"
János Besenyő: Logistic Experiences: The Case of Darfur -Promoting Peace and Security in Africa – Finnish Department of Strategic and Defence Studies (2006 – Series 2 No 35), pp. 41-59. János Besenyő: The first military operation between European Union and African Union. The European advisors role in Darfur – AARMS (Miklós Zrínyi National Defence University), Volume 6, Issue 4. 2007, 771-784.